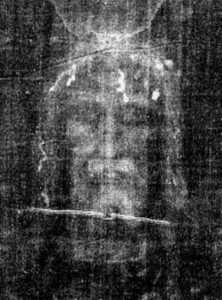 The famous Shroud of Turin has long been an enigma – defying science’s attempts to prove definitively one way or the other that it is the actual burial shroud of Jesus. But whether the Shroud is clever forgery or the real shroud of a man crucified (not necessarily Jesus), may not really matter. It is a startling image by any standard, and has a temendous power to teach anyone interested in the physical reality of what crucifixion was, and what Jesus suffered – for each one of us. Of a piece of old cloth, purportedly a fake? Beyond public reach, long tabernacled in Turin. These troubling wounds, seared by… radiation? A snapshot of Jesus, or neat medieval mirage? By a bloody battering, and nails haemorrhaged. Teaching us His passion, cruelty beyond obscene. To stitch into our soul’s fabric the price He paid? Can we see that image as portraying the man Jesus? Flayed red raw, and crucified for each one of us? And then be struck by the One looking back at me. And might this cloth reveal a deeper wonder still? Death’s contumacy rumbled by a far greater Will?